As the powerful entity created from the merger of Empresa Nacional Bazan and Astilleros Espanoles at the end of 2000, IZAR has underscored a commit- ment to design and engineering technol- ogy development, in conjunction with efficient production, in its drive for busi- ness in the specialized vessel markets. Presently the only European ship- builder holding contracts for the con- struction of LNG carriers, IZAR's gas tanker program is impressive by any standards, amounting to five vessels of 138,000-cu m capacity. The network of facilities encompassed by the state-owned group, including five commercial newbuild yards, offers not only critical mass but also production flexibility, enhanced through the more integrated operational approach now being adopted. Thus, while deliveries of the series of LNG carriers are scheduled from two yards, Sestao and Puerto Real, subcontracting of large elements to other parts of the group taps the organi- zation's wider scope. Double-bottom blocks for two of the ships have been assigned to the Sevilla yard, in a move that confers a better work distribution throughout the company while better ensuring that newbuild completion dates can be met. FPSO (floating, production, storage and offloading) vessel, a 19,000-dwt chem- tanker and a growing list of large, suc- tion hopper dredgers. The Spanish group's penetration of the international market for sophisticated dredgers has sharpened competition in a field closely associated with builders in the Nether- lands, in particular. Dragages-Ports has two maintenance dredgers taking shape at the Gijon yard. 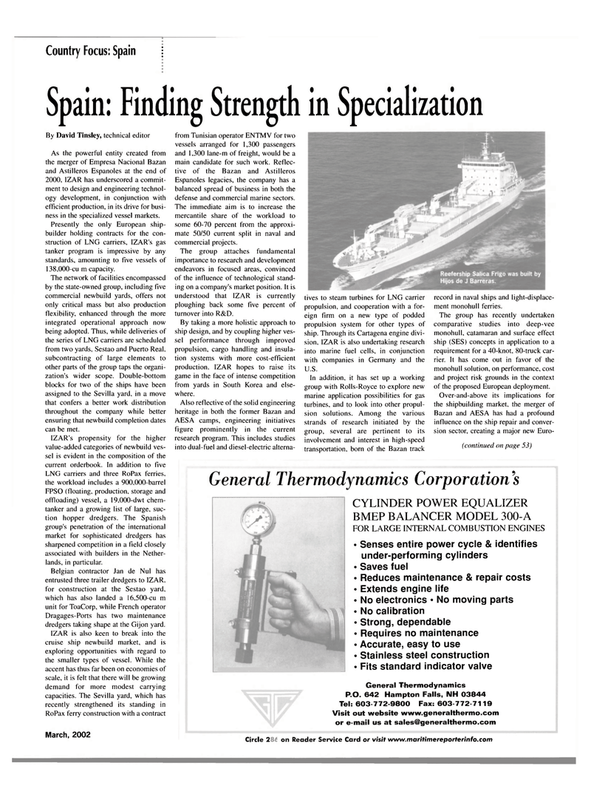 Espanoles legacies, the company has a balanced spread of business in both the defense and commercial marine sectors. The immediate aim is to increase the mercantile share of the workload to some 60-70 percent from the approxi- mate 50/50 current split in naval and commercial projects. The group attaches fundamental importance to research and development endeavors in focused areas, convinced of the influence of technological stand- ing on a company's market position. It is understood that IZAR is currently ploughing back some five percent of turnover into R&D. By taking a more holistic approach to ship design, and by coupling higher ves- sel performance through improved propulsion, cargo handling and insula- tion systems with more cost-efficient production. IZAR hopes to raise its game in the face of intense competition from yards in South Korea and else- where. In addition, it has set up a working group with Rolls-Royce to explore new marine application possibilities for gas turbines, and to look into other propul- sion solutions. Among the various strands of research initiated by the group, several are pertinent to its involvement and interest in high-speed transportation, born of the Bazan track record in naval ships and light-displace- ment monohull ferries. The group has recently undertaken comparative studies into deep-vee monohull, catamaran and surface effect ship (SES) concepts in application to a requirement for a 40-knot, 80-truck car- rier. It has come out in favor of the monohull solution, on performance, cost and project risk grounds in the context of the proposed European deployment.